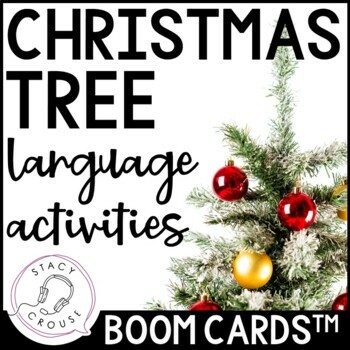 This deck of BOOM CARDS™ contains 35 cards to target various language skills within the context of an included non-fiction passage about the tradition and history of Christmas Trees. 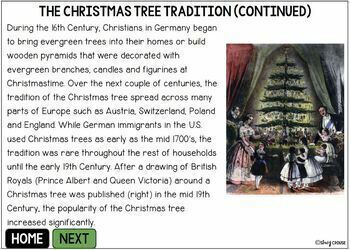 ★ Cards 2-5: Reading passage about the history and current tradition of Christmas trees. ★ Cards 28-35: Formulate a sentence about a photograph of a Christmas tree (open-ended). This task does not have right or wrong answers, so there are a variety of goals you can target (using conjunctions, verbs, pronouns, adjectives/descriptive sentences, increased length of utterance, inferencing). ★ Check out the PREVIEW for a link to a free playable preview of the deck! For MORE Boom Cards, click HERE! To use Boom Cards, you must be connected to the Internet. Boom Cards play on modern browsers (Chrome, Safari, Firefox, and Edge). Apps are available for Android, iPads, iPhones, and Kindle Fires. For security and privacy, adults must have a Boom Learning account to use and assign Boom Cards. You will be able to assign the Boom Cards you are buying with "Fast Pins," (play provides instant feedback for self-grading Boom Cards). Fast Play is always a free way for students to engage with Boom Cards decks. For additional assignment options you'll need a premium account. If you are new to Boom Learning, you will be offered a free trial of our premium account. Read here for details: http://bit.ly/BoomTrial. You may be eligible for a free trial from Boom Learning. Read here for details: http://bit.ly/BoomTrial. If you choose not to stay on a premium account after your free trial, you will still be able to assign all your Boom Cards to as many students as you see fit using Fast Play pins (which give instant feedback for decks that are self-grading). Boom Learning and Boom Cards are the trademarks of Boom Learning Inc. Used with permission.